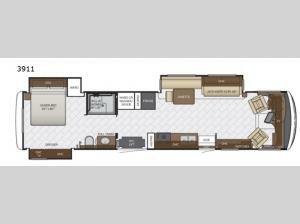 Newmar has thought of it all with this wheelchair accessible Canyon Star 3911 class A gas motor coach by Newmar. This model has triple slide outs and also offers plenty of features throughout that makes it easier than ever to camp with a wheelchair. There is a wheelchair lift as well as another entry door. In the bathroom you will find a 48" x 36" roll in shower and the bedroom has a queen bed plus there is plenty of storage with the wardrobe and dresser.